I was the first to arrive and get seated at the long table spread in the private area named 林檎閣. This was my fourth time at the restaurant, and the very first time where I've had a reservation. But I guess with an original party of 12 (we were down to just 10 today) that made things easy. As I seemed to be the one with the most experience - and most knowledgeable regarding the menu - I was tasked with ordering. Thankfully our organizer has also been to the restaurant, and I was able to discuss it with her. Always helpful to have a second opinion! 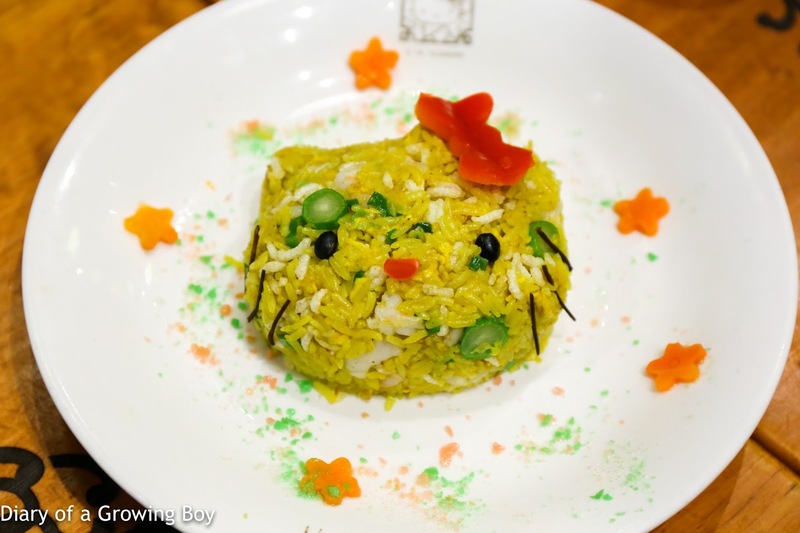 One last thing... for some reason the restaurant served this on a plate that had clearly just come out of the fridge. It was chilled! Now, why would you serve a hot dish on a chilled plate?! 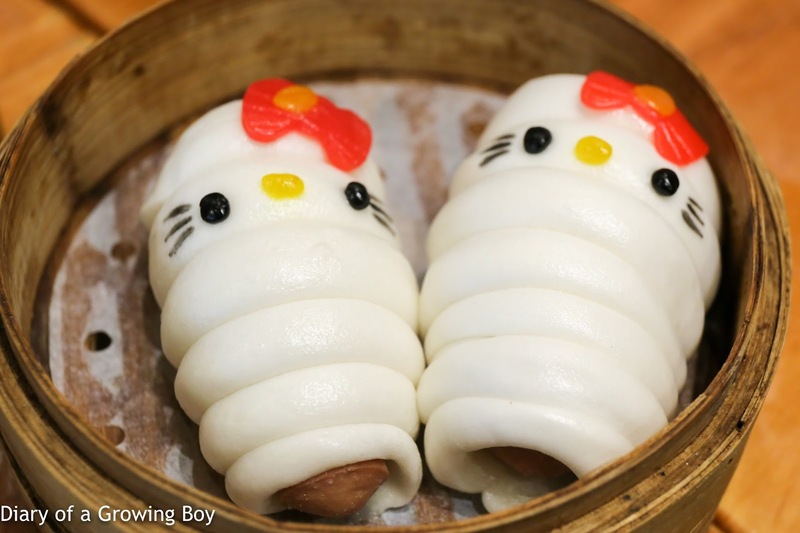 Hello Kitty barbecued pork puffs (叉燒酥) - not up to par today. 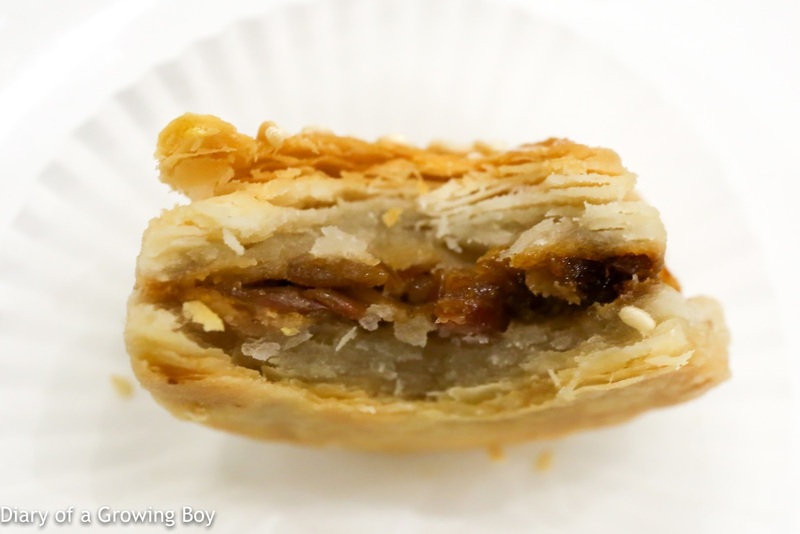 I thought the puff pastry tasted a little off... like the oil or shortening used had gone off. Hello Kitty bow puffs (蝴蝶角) - I didn't like this much the first time, so I only ordered one portion and didn't have any. 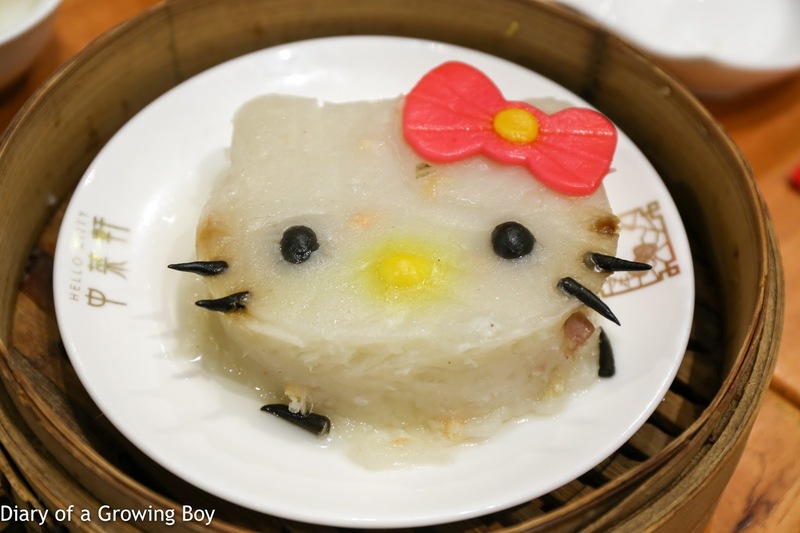 Hello Kitty steamed turnip cake (Hello Kitty蒸蘿蔔糕) - I've always been curious about this since they introduced it, and this was OK. 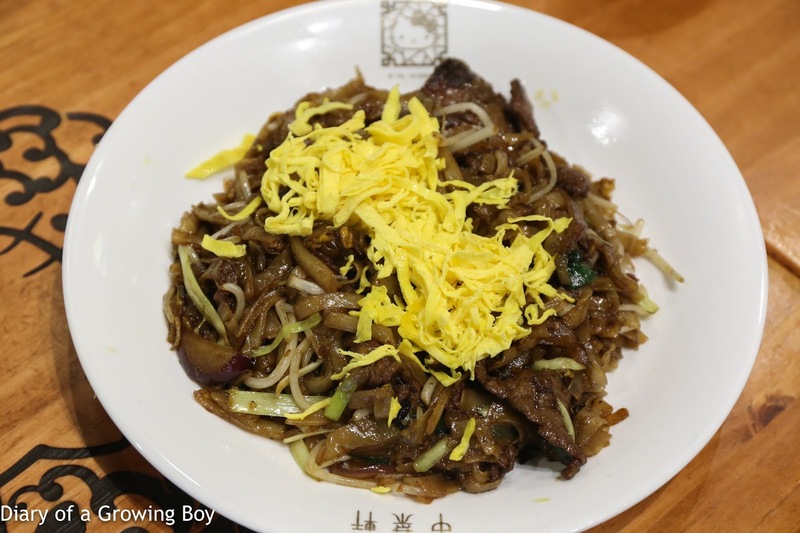 There were actually strips of radish inside, and surprisingly this had a slight spicy kick on the finish. 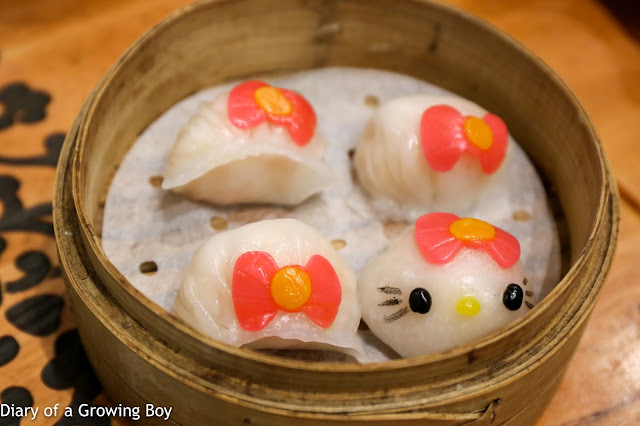 Hello Kitty steamed prawn dumpling (蝦餃皇) - these have always been of reasonable quality. 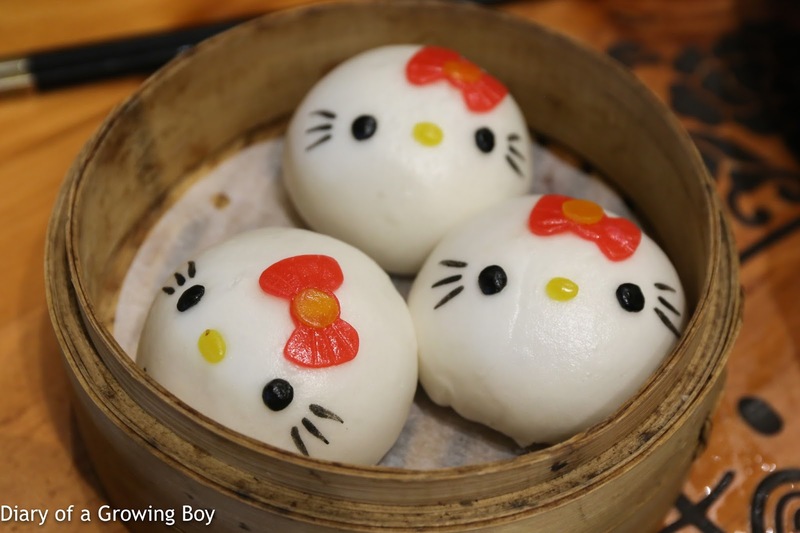 Hello Kitty steamed pork patty with squid (Hello Kitty土魷玉蝴蝶) - this was surprisingly good. 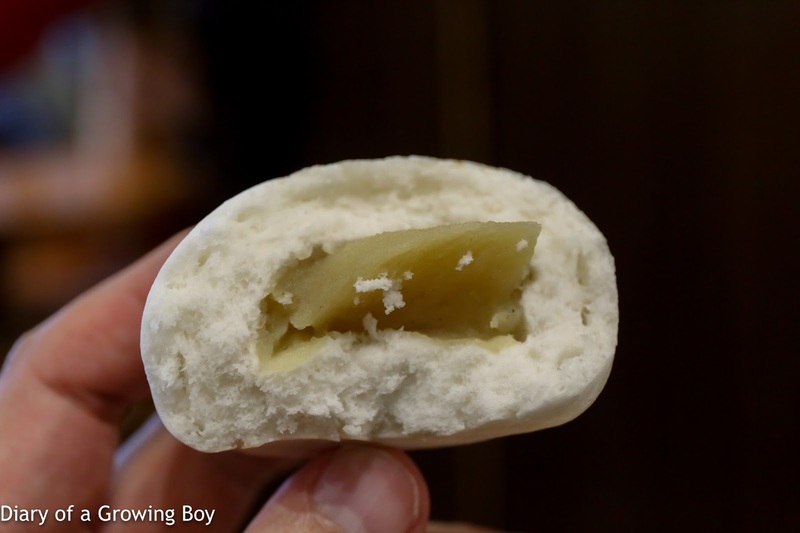 The thickness meant that it wasn't over-steamed, and the little bits of dried squid inside were pretty decent. 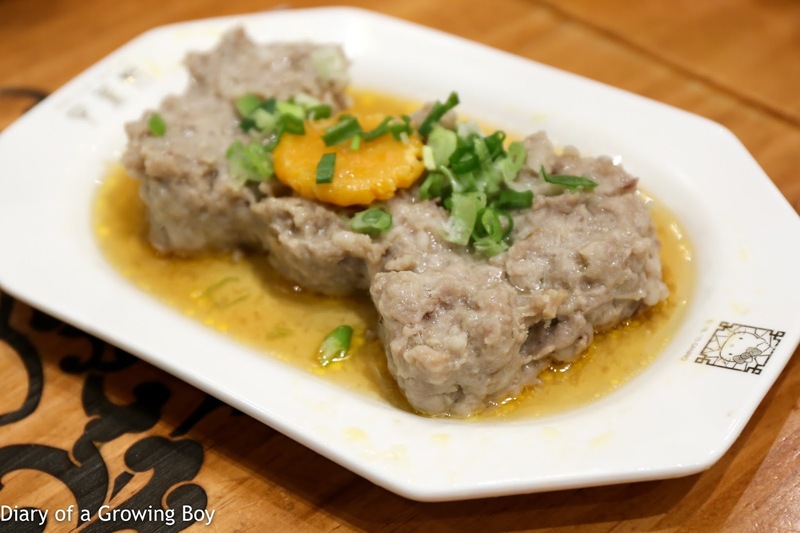 The salted egg yolk on top wasn't too dry, either. 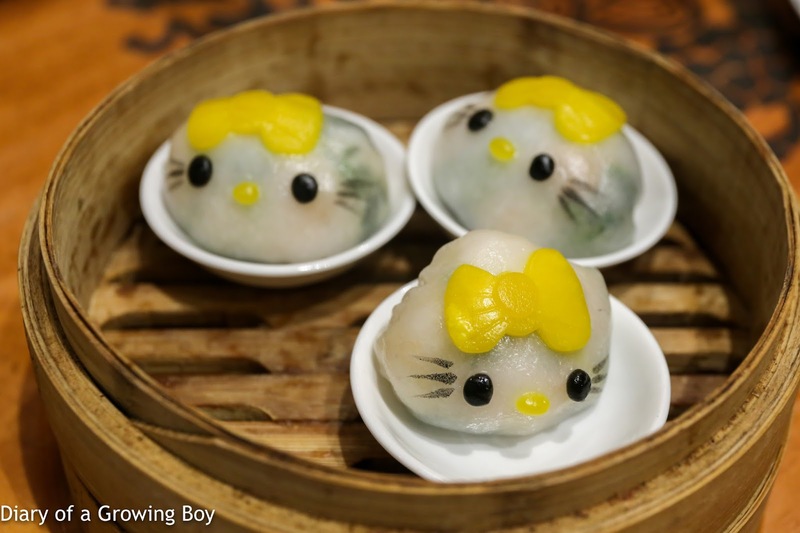 Hello Mimmy vegetables and shrimp dumplings (Hello Mimmy菜苗餃) - this is the only dish named after Hello Kitty's twin sister Hello Mimmy. 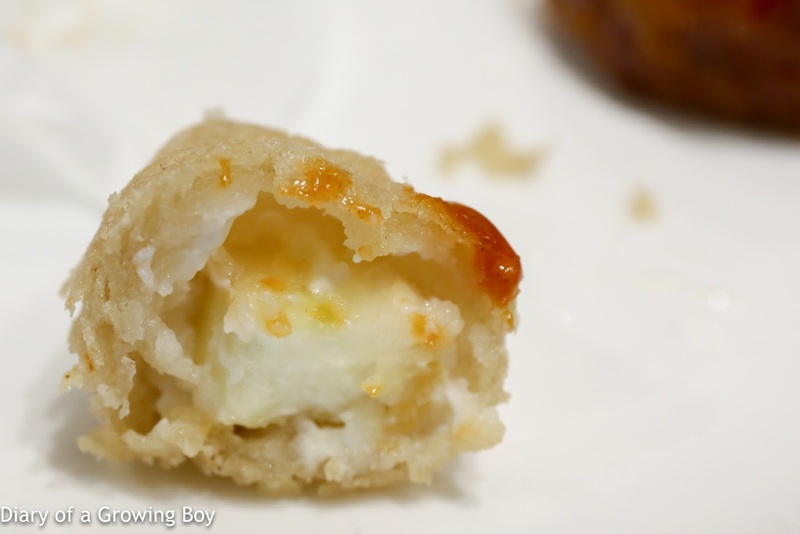 These were actually not bad at all, with spinach mixed together with shrimp inside. 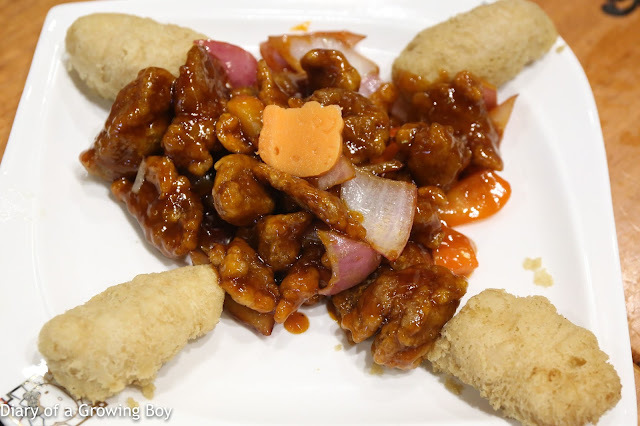 Sweet and sour pork (秘方咕嚕肉) - I was told by our organizer that this was pretty good, and it was! 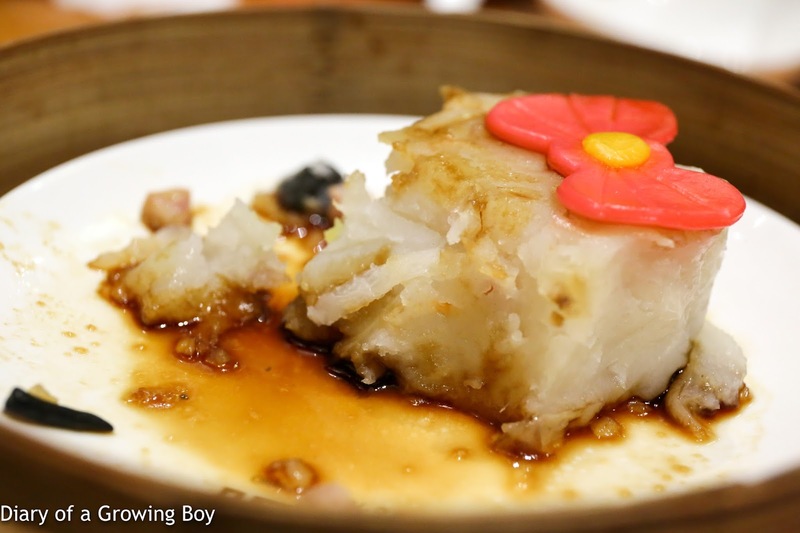 Even though there was a bit of starch, the sharp acidity from black vinegar was pretty nice. The failure, though, came in the form of the apple fritters on the side. Just not very good at all... and the batter just tasted off. 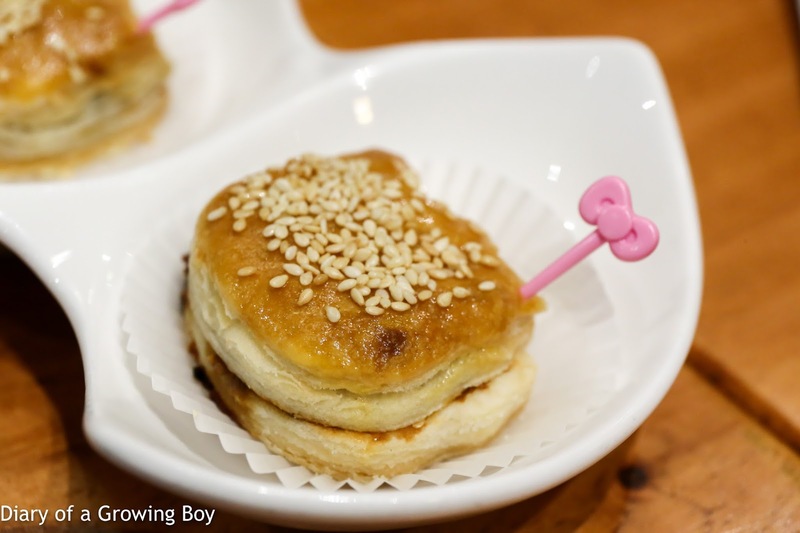 Hello Kitty steamed sausage rolls (腸仔卷) - these were as good as I remembered, with baby franks instead of the Cantonese sausage that they should have come with. 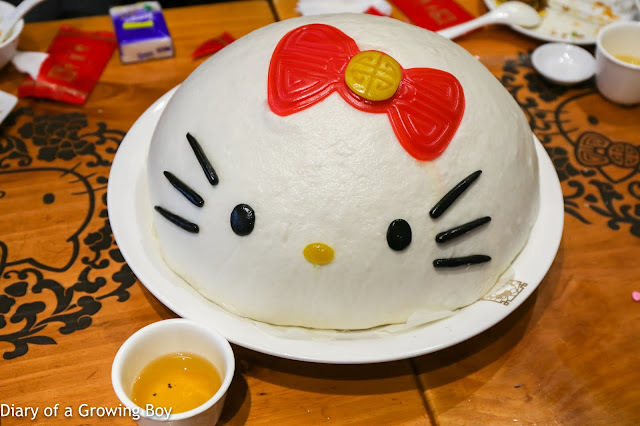 Giant Hello Kitty birthday bun (百子千孫) - now THIS was the pièce de résistance! I reminded our organizer to pre-order this, as this was a special item which they only make a limited number per day. I was soooo happy that we got this! Just look at the size of that thing! 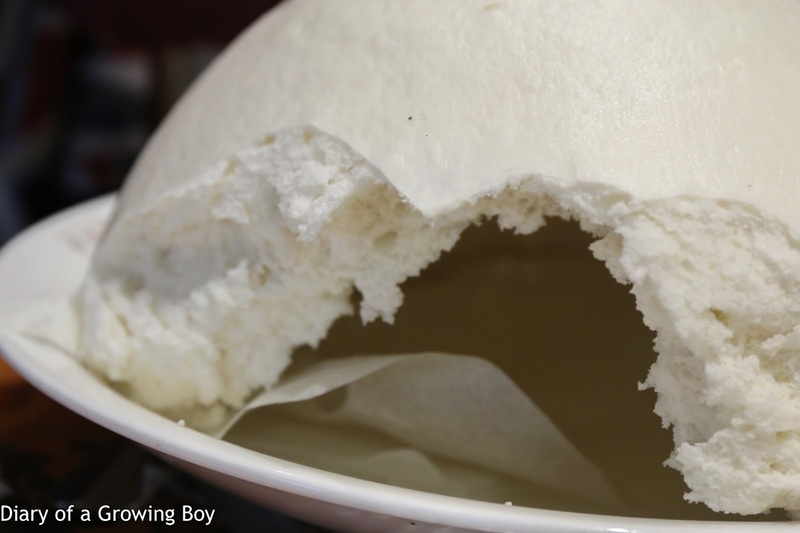 Yes, the bun dome is edible. In fact, it was a little more moist than the buns underneath. 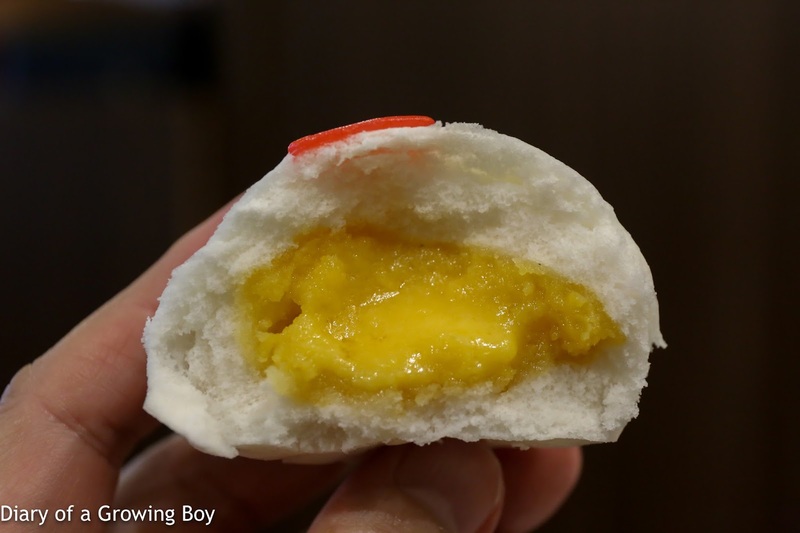 Hello Kitty custard buns with egg yolk (流沙包) - actually not bad, and probably as good as I remembered. 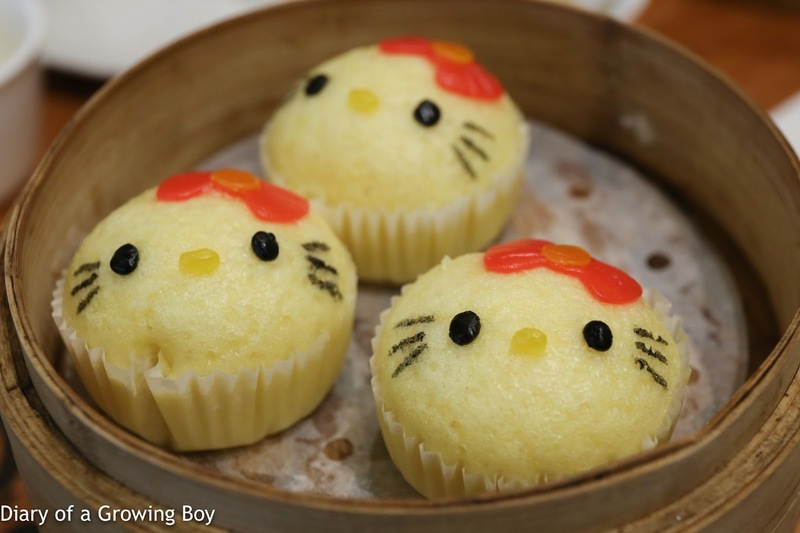 Hello Kitty steamed brown sugar sponge cake (馬拉糕) - not as good as my first time. The color looked much paler, and is kinda pale yellow instead of more brown. Maybe they used less brown sugar today. Great review. I really need to get over there before my daughter grows too old!